When you need results, look to Avery. The challenge faced by Healthcare providers today is unprecedented. Shrinking reimbursement and regulatory compliance are just some of the challenges to managing expenses faced by healthcare today. We combine quality service with efficient utilization of resources to provide the right solutions to your Health Information Management needs. Avery Partners brings real world hands-on experience to every aspect of the healthcare revenue cycle. Our understanding of your business requirements are built on years of Revenue Cycle management both as consultants and in managing our own facilities. We know every interaction with your payers is a direct reflection on you our customer and have developed our operational processes to create a culture of advocacy for our customer’s brand. Cost containment, operational efficiency and sustainable performance improvement are critical to surviving and thriving in today’s environment. Below are five critical areas that are critical to our client’s success. Avery Partners is uniquely positioned to deliver in all five areas. 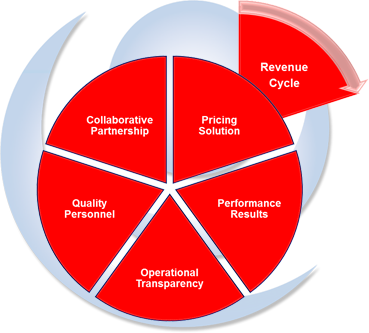 Avery Partners offers multiple pricing options and solutions to meet your business requirements. Providing contingency and/or hourly models enables us to work within your financial goals while still providing best-in-class staff, management and overall service. Maintaining a positive cash position has never been more challenging or important to your success. Avery Partners is committed to and has a track record of generating cash improvements for our clients. While we adhere to and believe in the ‘ownership’ philosophy of engagement on accounts resolution, we believe equally in full disclosure. This is reflected in the methodology we have developed to service our clients. By adapting to our clients business processes, specifically working within their technology platforms, our clients have 100% access to all Representative activity. Avery Partners provides turn-key outsourcing including recruitment, on-boarding, facilities, required tools and management oversight to effectively meet short term project goals. We also deliver highly qualified personnel to join your team or just help clear work load. Open and frequent communication regarding denial management is critical to the successful operation and positive cash flow of a healthcare system. Avery Partners provides continuous feedback to ensure our customers are aware of trends, either systemic or payor driven, that affect adjudication.